Industrial lift truck accidents are a common and costly occurrence. OSHA estimates that there are 68,400 accidents, each year, involving powered industrial trucks. Approximately 90,000 workers suffer some type of injuries in these accidents, resulting in lost worktime, workers' compensation claims, and productivity losses - not to mention the damage inflicted upon equipment and facilities. About 100 people lose their lives each year in these accidents. Steel King's "Steel Guard" protective railing system is a cost effective barrier against the effects of such accidents. Great for shielding production equipment, conveyors, workstations, docks, racks, mezzanine bases, in-plant offices, tool cribs, building walls, and more. 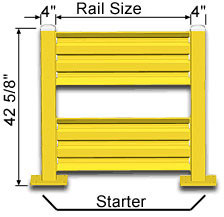 Starter Units consist of 2 posts, 2 guard rails, hardware, and floor anchors. 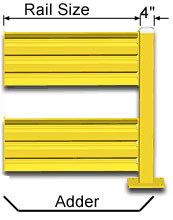 Adder Units consist of 1 post, 2 guard rails, hardware, and floor anchors.